On June 12th the World Cup kicks off in Brazil; the country has been beset by protest in the run up to the tournament. Last year up to a million people demonstrated across Brazil: protesting the vast expense of the World Cup, calling for better public services and an end to corruption. 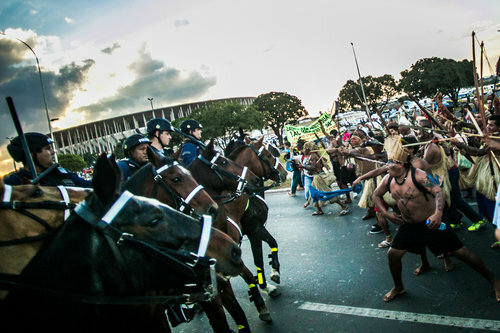 On June 3rd, the police were accused of heavy handedness as protestors gathered outside the World Cup Stadium in Goiania, during a friendly football match between Brazil and Panama. 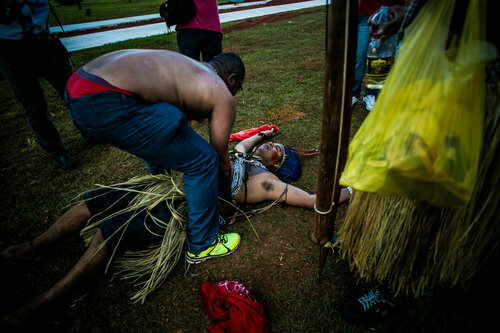 The demonstrators condemn the 15 billion dollars spent on the tournament which could have gone towards social services and improving living standards for the poor of Brazil. It's the latest in a long line of demonstrations. Police fired tear gas and stun grenades into the crowd. One policeman was reportedly shot in the leg with an arrow. At first glance the inhabitants of Brazil's urban slums, the favelas, and the indigenous people of the Brazilian Amazon may not seem to have a common cause. But both groups face violence with impunity from police and the military, poverty, land insecurity, neglect by the authorities. The Brazilian government is brushing them under the carpet. On June 9th the legendary Chief Raoni Metuktire and his nephew Chief Megaron Txucarramãe, members of the Mebengôkre Kayapó tribe in the Brazilian Amazon, will arrive in London to gather support for the Kayapó and for all the tribes across Brazil in their struggle to protect their ancestral lands and way of life. They are urging the Brazilian government to demarcate the region known as Kapôt-Nhinore, which is sacred to the Kayapó. They will be holding a press conference on June 9th - I will be there to speak in their support, as Founder and Chair of the Bianca Jagger Human Rights Foundation (BJHRF). 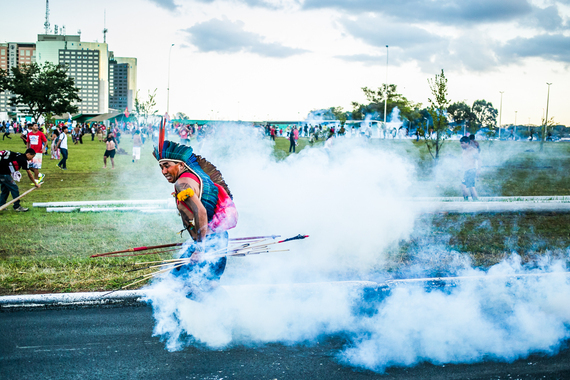 It is a critical time for indigenous rights in Brazil. 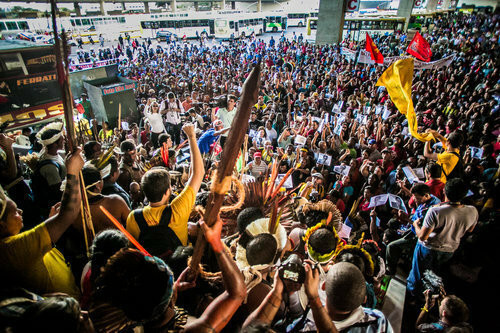 The Kayapó, and all the indigenous peoples of the Amazon are threatened; by mega-dams, illegal mining, logging, occupation by settlers and ranchers, and by companies and large corporations, by proposed legal reform and constitutional amendments which if allowed to go ahead will strip the tribes of their territorial rights, and endanger their livelihoods and cultures. Throughout my life I have campaigned on behalf of indigenous peoples all over the world: in South America, Asia and Africa. I have witnessed the suffering of many of these ancient tribes, murdered, threatened, abused, forced from their homes and deprived of their way of life. Millions of indigenous people have become refugees in their own land and we don't know how many thousands have lost their lives. The values of indigenous people have shaped my relationship to the earth, and our responsibilities towards her. During my thirty years of campaigning for human rights, social justice and environmental protection, I have campaigned on behalf of many indigenous tribes in Latin America: the Miskitos and Mayangna in Nicaragua, the Yanomami, the Guarani, and the Surui Paiter in Brazil, the Cofán, Siona, Secoya, Kichwa, and Huaorani tribes in Ecuador, and the Quechua in Peru. I learned from their wisdom, and also from their courage. Traditional indigenous cultures use natural resources sustainably: forests, grasslands, rivers and wildlife, and preserve biodiversity. Protecting the rights of indigenous peoples is essential to our survival and that of the planet. Over and over again, indigenous peoples have been proven to be the best custodians of biodiversity in their ancestral lands. Brazil's 1988 constitution recognises that the Indians have an 'Original' and inalienable right to occupy and use their traditional lands. If it can be shown that the tribe historically occupied and used that area of land, it is theirs by right - it should become demarcated land. Kapôt-Nhinore has already been surveyed by the indigenous agency FUNAI for demarcation, but the process has been stalled by bureaucracy, and is threatened by proposed changes to Brazil's demarcation laws and constitution. In the past Brazil had an average of thirteen demarcations per year. Under President Dilma Rousseff this number has sunk to three a year. The demarcation process has been crippled by an unrelenting barrage of legislative proposals from Congressmen representing large agribusiness, mining corporations and the dam industry, designed to wrest the land from the indigenous tribes and open it to development. It is unconscionable. I urge President Rousseff to halt the Proposed Constitutional Amendment (PEC215) which would further delay the process for demarcations and claims: and would result in few, if any further demarcations being approved. Brent Millikan of International Rivers states, 'constitutional amendment PEC 215 would transfer authority for demarcation of indigenous lands from the Executive branch to the Congress.' Demarcation would become a political decision; power of the Executive being transferred to the Legislature, an abuse of the separation of powers, a foundation stone of the Constitution. Since the Congress is today dominated by the Bancada Ruralista - the large landowners' lobby - it is highly unlikely that any demarcation would be granted. Even if it were, finding time for Congress to debate each demarcation would mean even more delays introduced into the process. Because the change would effectively be retrospective, Congress would also acquire the power to reduce or reverse territories (TI's) which have already been demarcated. I urge President Rousseff to halt PEC 215 and the other proposed amendments to the Brazilian Constitution and laws which are eroding the indigenous peoples' right to their ancestral lands. Some proposals would open up indigenous territories for mineral and oil extraction - mining companies have already begun to lodge claims to the territory. Some would not only permit, but effectively force the indigenous people to allow cattle ranching and agriculture on their land. If allowed to go ahead, these changes could destroy the forest and traditional lives of the Kayapó and many other tribes across Brazil. I call on the Brazilian government to enforce the Kayapó's rights to their land, which are enshrined in the 1988 Constitution. I appeal for protection for the hundreds of tribes in the Brazilian Amazon who are continually threatened by landowners, illegal mining, logging, occupation by settlers and ranchers, and by companies and large corporations which continue to trade in produce from illegally farmed crops on indigenous territory, by reckless development projects which threaten their lives and livelihoods. Otherwise indigenous people will continue to be murdered, abused and pushed off their ancestral land. 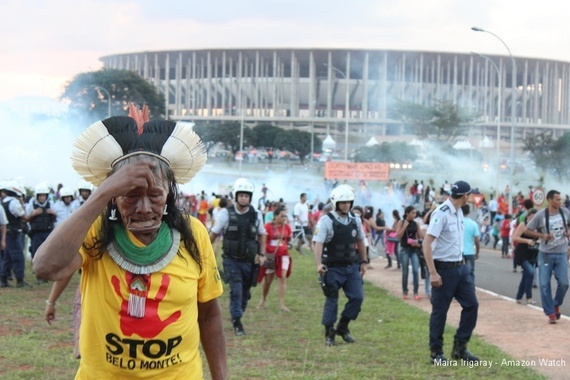 I have campaigned against Belo Monte for many years. In March 2012 I went on a fact finding mission to the Xingu. Construction on the dam had then just begun. I travelled down the Xingu River in a small boat. I was accompanied by my courageous friend Antonia Melo, co-ordinator of Xingu Vivo, a collective of local NGOs opposed to Belo Monte, and Ruy Marques Sposati. We saw the great red scarred coffer dams, the beginnings of Belo Monte, rearing out of the river. I met with indigenous leaders, with local communities, NGOs, government officials, extractavists - and the Bishop of the Xingu, Dr Erwin Krautler, whose concern and care for the people affected by Belo Monte was evident. I was distraught by the suffering I witnessed in the area. I published my findings in a report on the Huffington Post: The Belo Monte Dam, an Environmental Crime. I urge you to read it. The people of the Xingu need our support. And Belo Monte is only part of the plan: on 25 April 2014 it was disclosed in Lima, Peru that 412 dams are planned across the Amazon. 256 of them are in Brazil, 77 in Peru, 55 in Ecuador, 14 in Bolivia, six in Venezuela, two in Guyana, and one each in Colombia, French Guyana and Surinam. Five of the six rivers which run through the world's largest tropical forest will be dammed - and damned. All over Brazil, even now, the Amazon's waterways are being blocked and diverted. The river system that provides a fifth of the world's fresh water is being dammed, polluted and fouled up. It is imperative that indigenous rights, including the right to free, prior and informed consent, be respected in places like the Tapajós basin, in the heart of the Amazon, where the Brazilian government plans to construct up to 29 large dams, following the same destructive model as Belo Monte. In 2009 the Kayapó wrote a letter to Electrobras, the parastatal energy company that is partnering with huge construction companies such as Odebrecht, Andrade Gutierrez and Camargo Correa to build mega-dams in the Amazon and elsewhere in Latin America and Africa. . The Brazilian Amazon is one of the wonders of the world. It is critical to survival of the people of Brazil, and people throughout the world. A quarter of all land animal species are found in the Amazon. The rainforest absorbs around 2 billion tons of carbon dioxide per year. It is vital in the race against climate change. 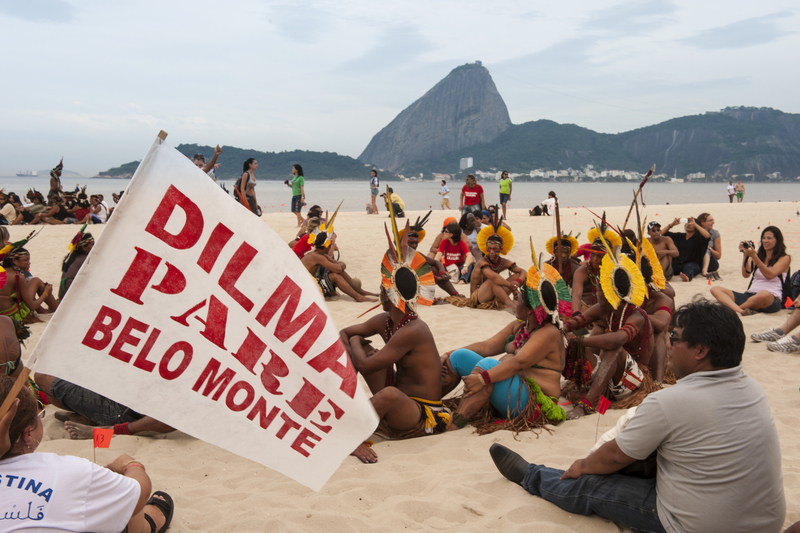 I urge President Rousseff to save it, and put a stop to Belo Monte and the other dams. The plight of the Kayapó illustrates the failure of governments all over the world to protect indigenous peoples and their ancient way of life. The Kayapó have a rich and ancient culture. Their name for themselves, Mebengôkre, means 'people of the space between waters,' but the name 'Kayapó' was given to them by outsiders. It means 'those who look like monkeys,' probably from the traditional ceremonial dance in which the men wear monkey masks. I appeal to the Brazilian government to affirm the Kayapó's rights to their sacred land in Kapôt-Nhinore, and to do everything in its power to protect them. President Dilma Rousseff has a choice. I urge her to seize this leadership opportunity, to halt PEC215 and the other unconscionable, unconstitutional amendments and changes to law which will threaten indigenous peoples' rights to their land across Brazil. If these proposals go ahead, hundreds of tribal cultures may disappear and Brazil will lose an irreplaceable part of its heritage.